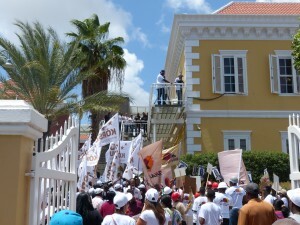 WILLEMSTAD - 14 political parties will participate in the elections on April 28 this year. Tomorrow they will have the opportunity to officially present their candidates’ list to the Supreme Electoral Council (SEC) in Otrabanda. 5 parties will have to garner support during the preliminary round before they can actually participate in the election. The reason is because these parties don’t have representation in Parliament. This includes PIN, the new party of Minister Suzanne Camelia-Römer. PIN stands for Partido Inovashon Nashonal, the party for national innovation. Römer left her former party PNP after she was placed second on the candidates’ list.